After his release from the Colorado Rockies in 2015, Wilin Rosario’s options were limited. The once highly touted catcher with a great bat was considered a liability behind the plate. Instead of waiting around, Rosario went overseas where he’s dominated the last two years. In 2016 Rosario put up numbers very similar to Eric Thames when he played for the NC Dinos; 33 home runs, 120 RBI, and 31 doubles. His .321 batting average was a career best as well was his OBP (.367) and SLG (.593). When I wrote about Rosario earlier this year, his stats at 54 games were right on point; .325/14/46. At the conclusion of 2017, he actually surpassed his breakout season from the year before. He even obliteratedrecords with his ability to hit the long ball. In June, he went deep eight times in a three game series, shattering the previous record of five in three. In eight less games and shy nearly 50 at-bats from the previous year, Rosario scored 22 more runs (100), popped 37 home runs, and drove in 111. He increased his walk total by 17 and reduced his strikeouts by 29. 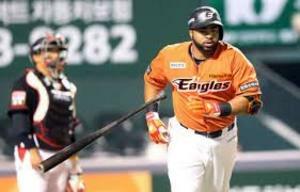 His .339 average (a career high) was good for eighth in the Korean Baseball Organization, and placed second in slugging (.661), 10th in OBP (.414), and second in OPS (1.075). If Eric Thames, who was relatively given his walking papers from the game, can leverage his success to a new contract, there’s nothing to say Rosario can’t either. With numbers like these there’s almost no way a MLB club couldn’t take another shot on him. MLB Insider, Jerry Crasnick has reiterated the same sentiments. There’s absolutely nothing to lose and at 28 years old, he’s entering his prime.